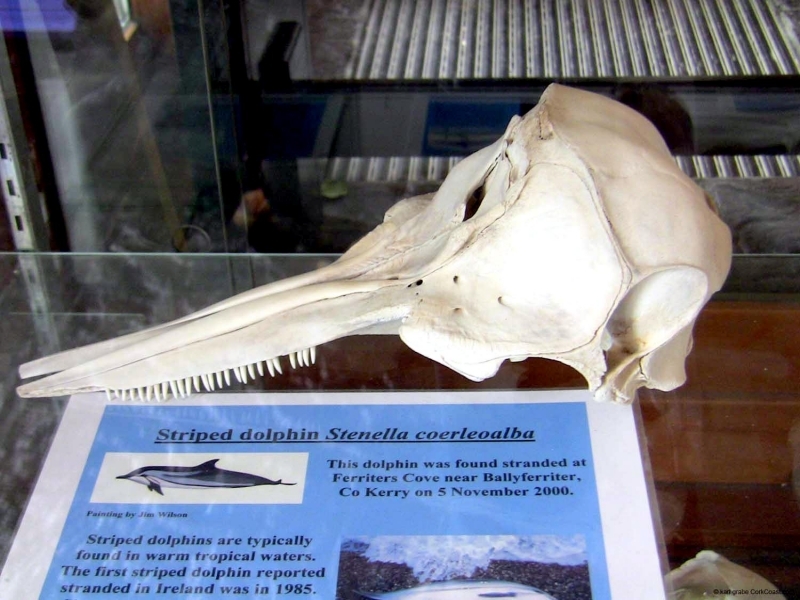 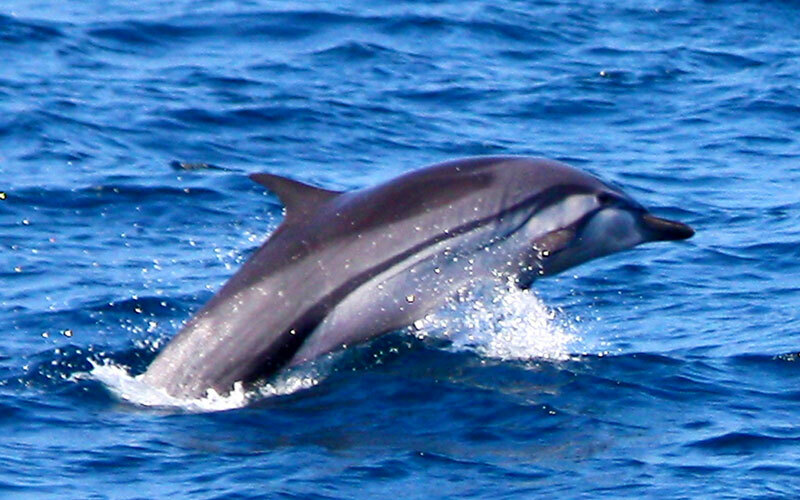 Striped Dolphins range in body lengths from 2.2 to 2.4 meters and have a fusiform (tapers at both ends) body, like all dolphins with tall dorsal fins, long, narrow flippers and a prominent beak. 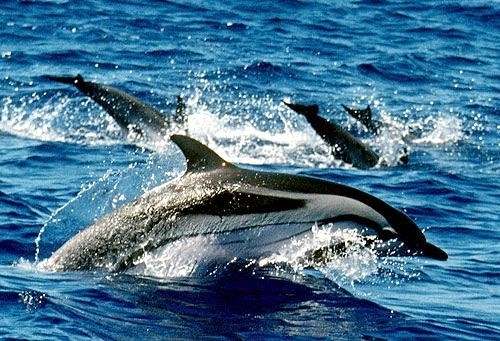 They are named for their characteristic stripe patterns. 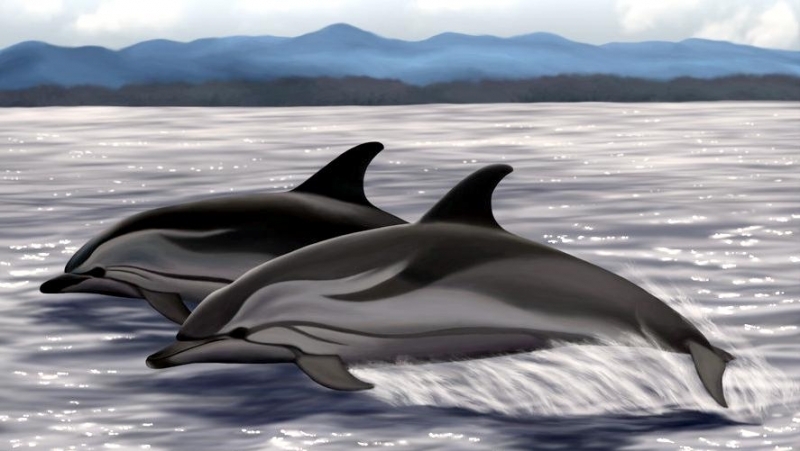 They are blue-gray in color with a dark dorsal cape and light coloring on their ventral (under) side. 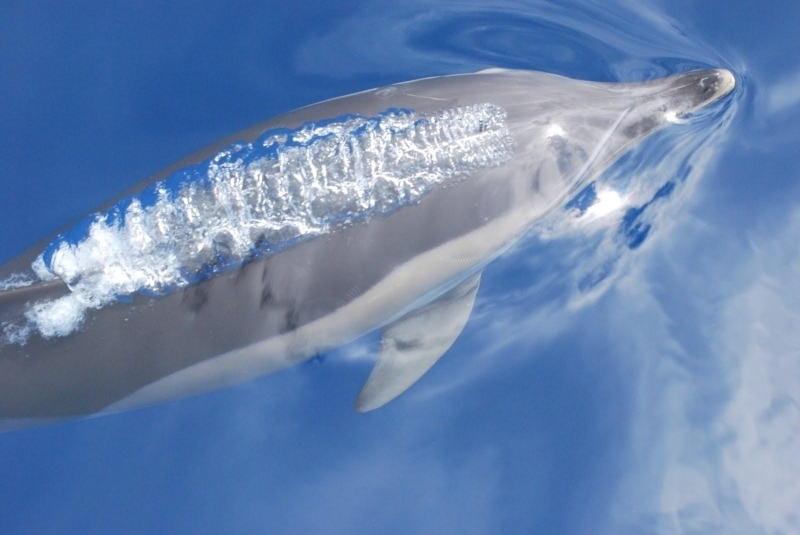 A blue-black stripe extends along the length of their body and they have black stripes on their flippers. 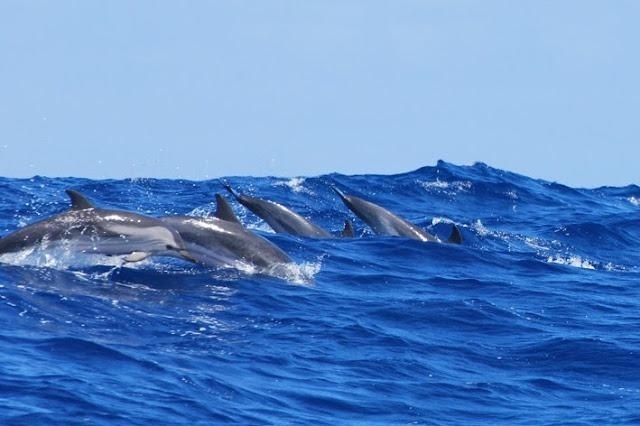 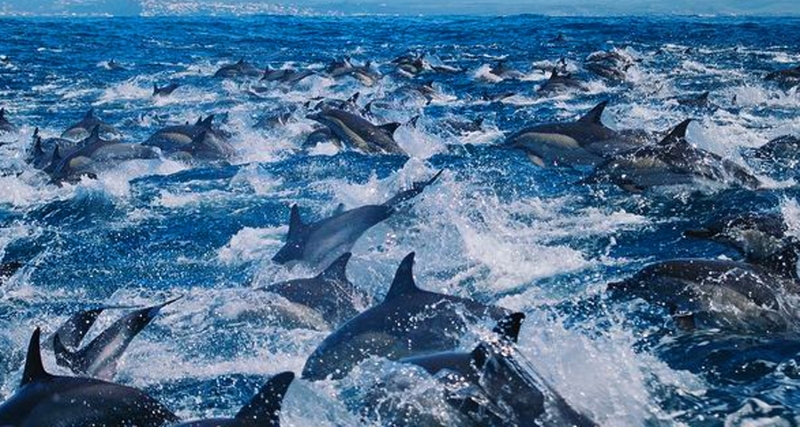 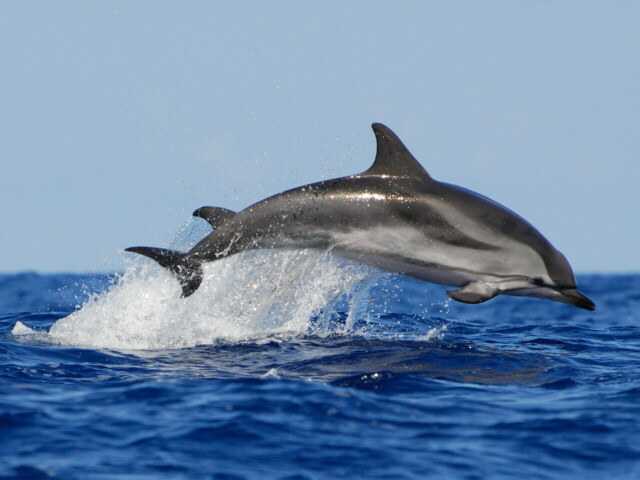 Striped Dolphins are a gregarious species found in pods between a few to super pods of over 1,000 individuals with average pod sizes ranging from 32 to 50 individuals. 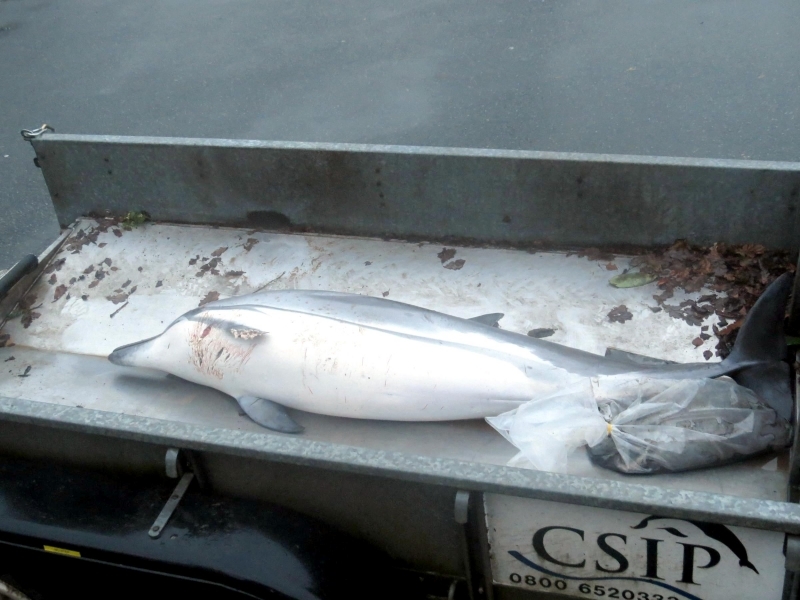 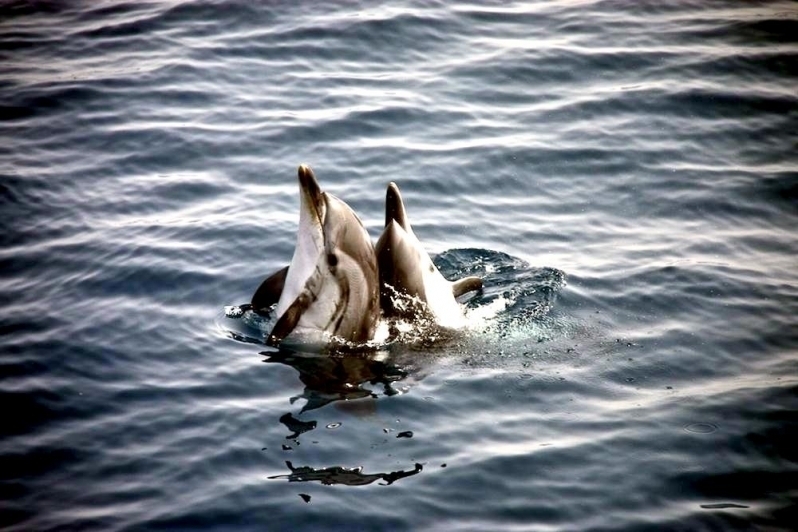 Pods consist of either juveniles, breeding adults or non-breeding adults. 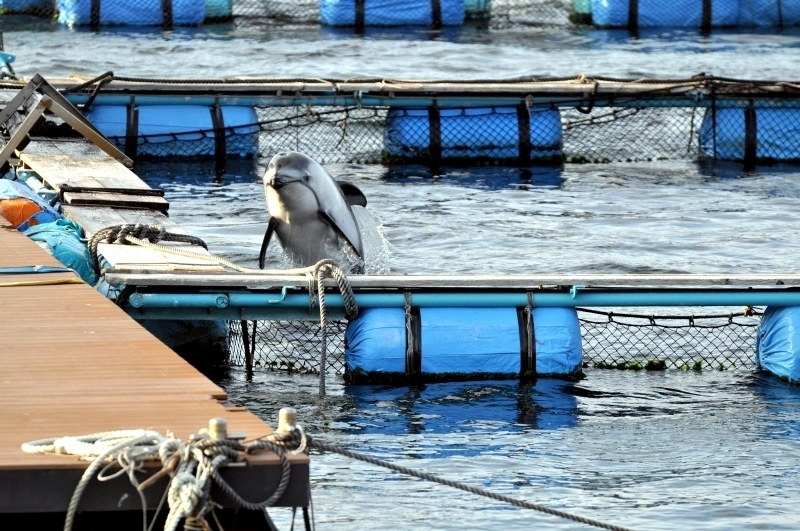 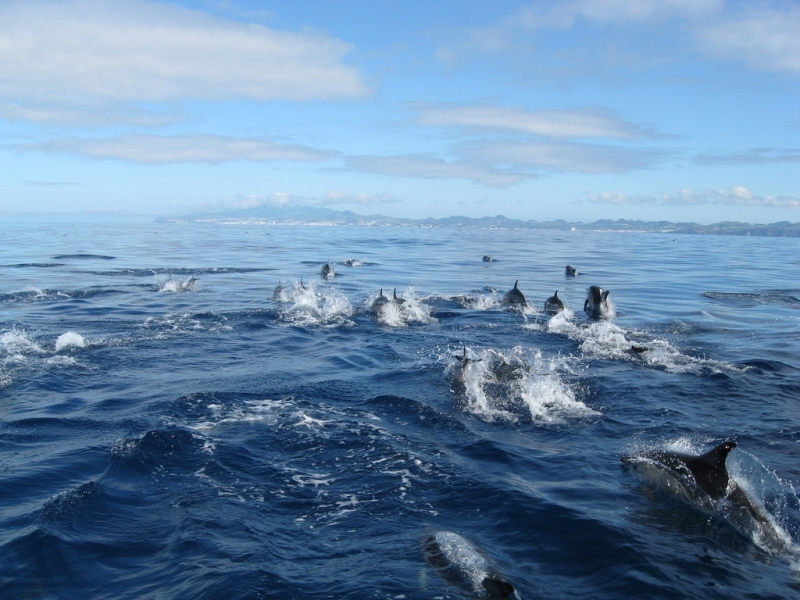 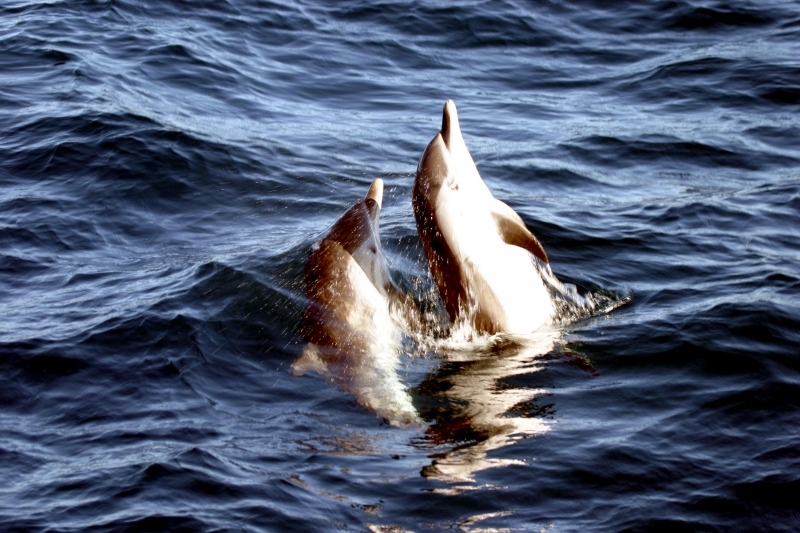 Calves typically join the juvenile pod about 1 to 2 years after weaning. 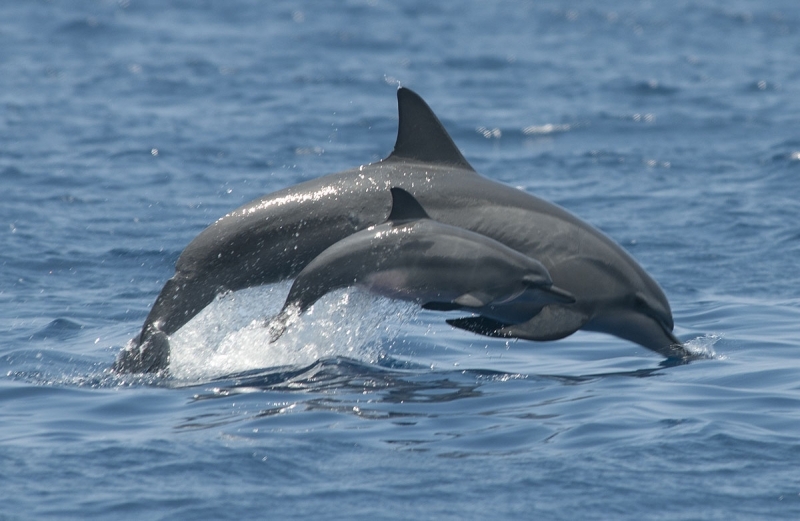 Females typically join the non-breeding adult pod during the transition to sexual maturity. 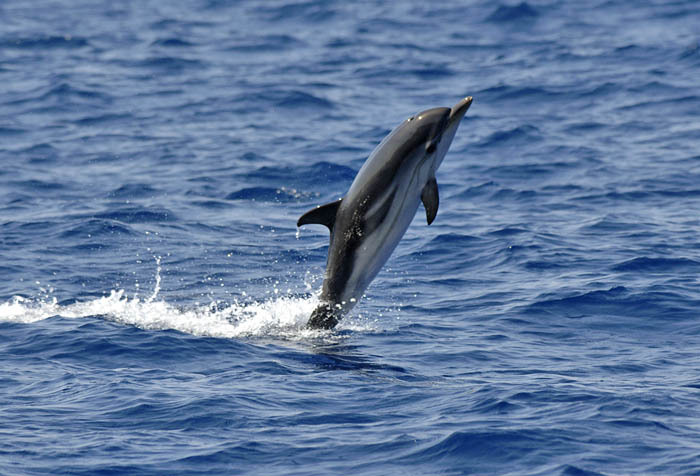 They are very agile and are known to breach (jump out of the water), bow ride and “roto-tail”, a behavior where they make high arcing jumps then rapidly rotate the tail several times before re-entering the water. 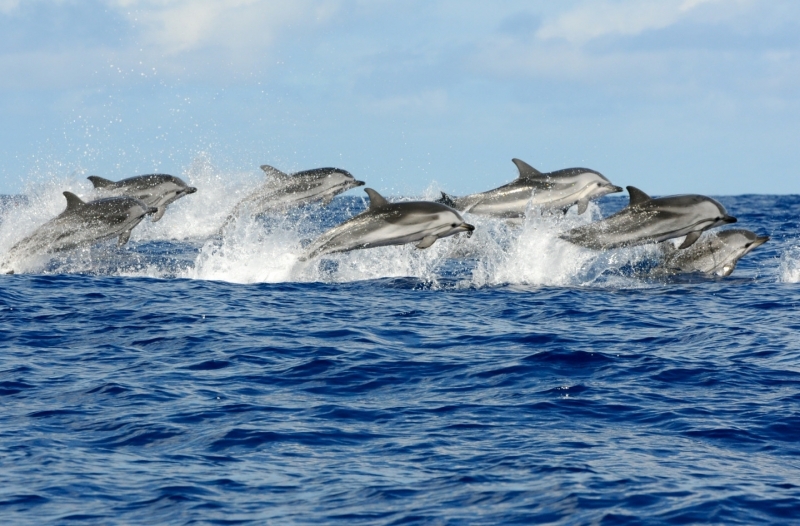 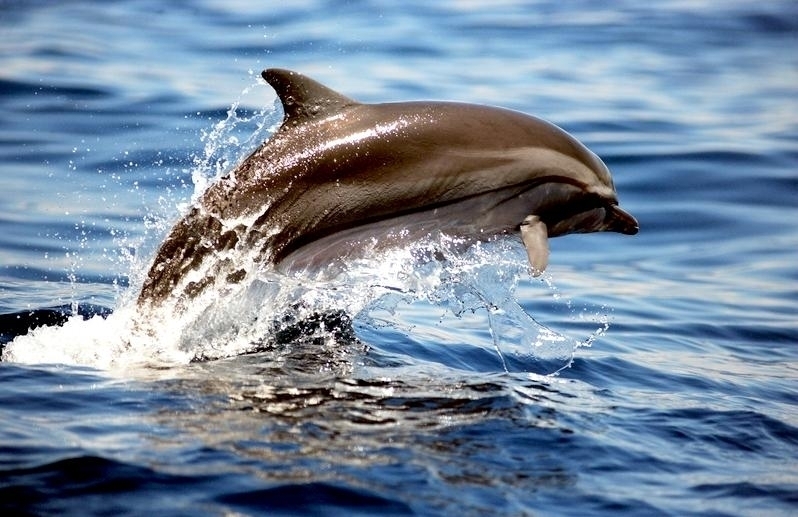 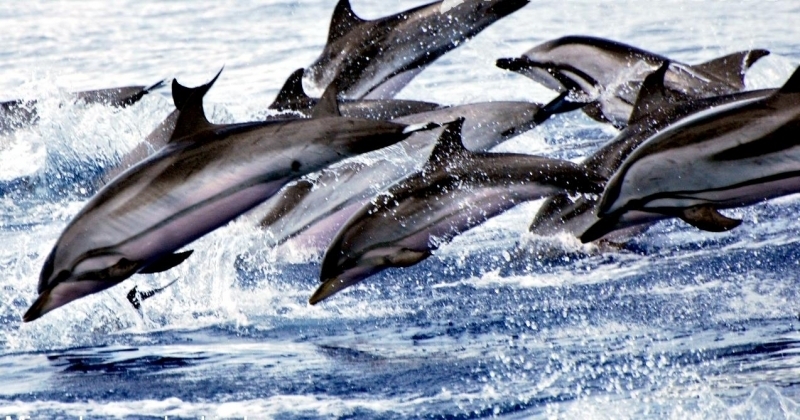 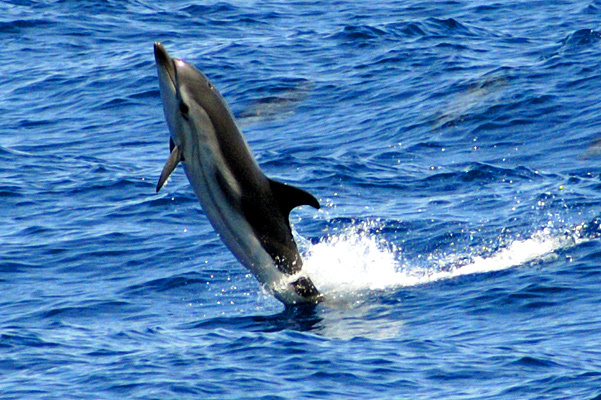 Striped Dolphins communicate using clicks and whistles like many other dolphins. 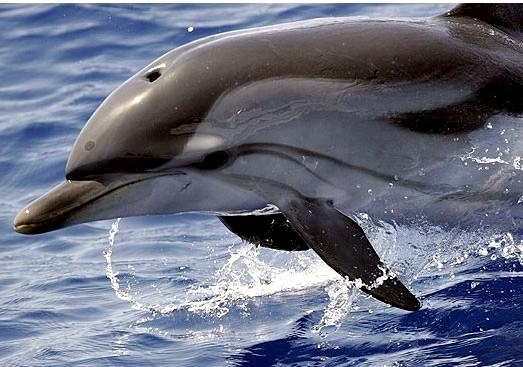 They are found in warm-temperate & tropical seas throughout the world including the Mediterranean Sea, Pacific Ocean, Atlantic Ocean, Indian Ocean, Caribbean Sea and in the northern Gulf of Mexico. 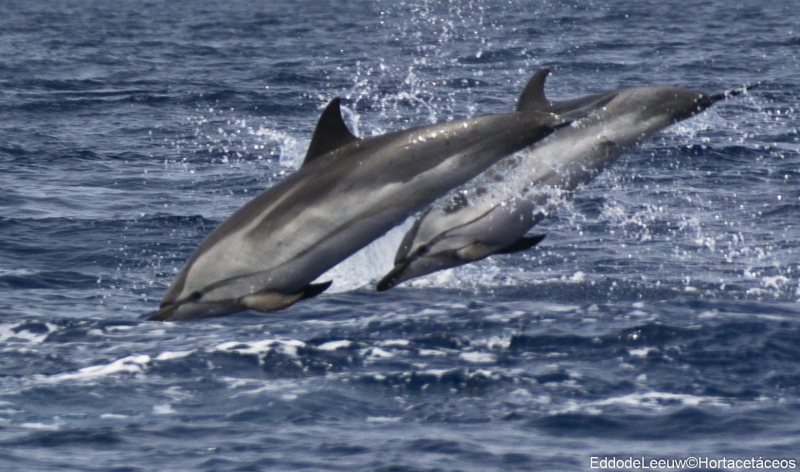 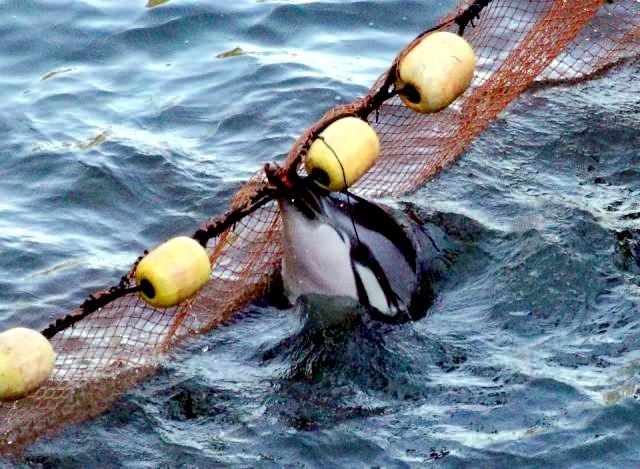 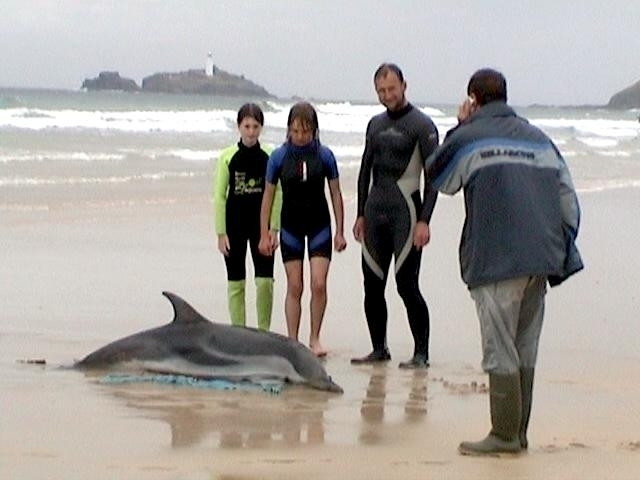 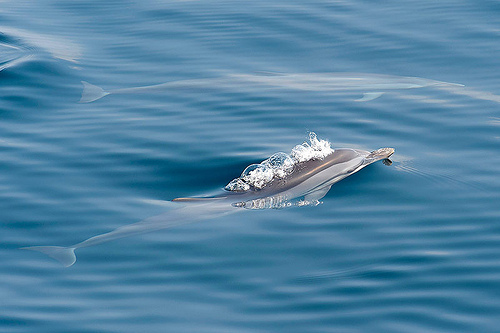 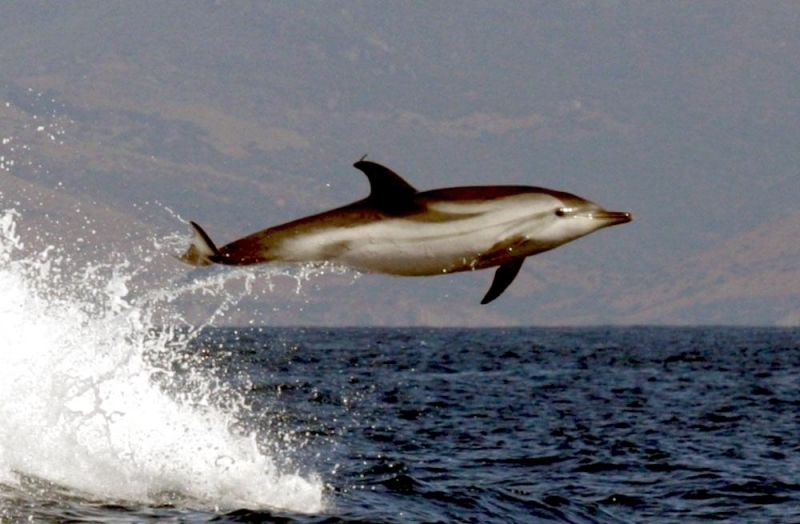 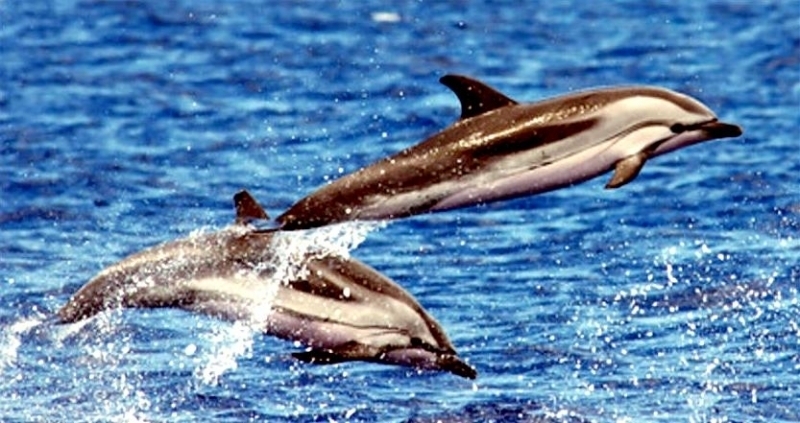 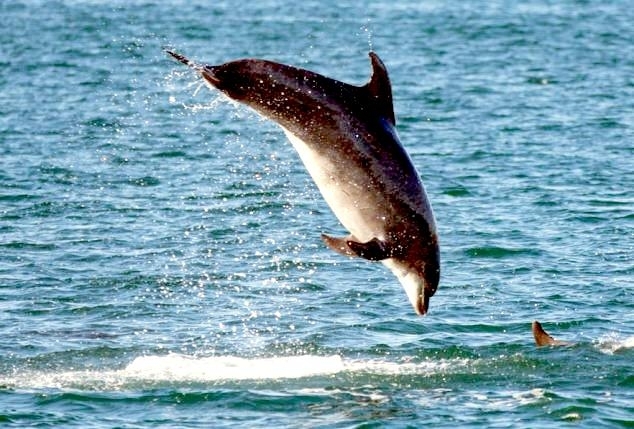 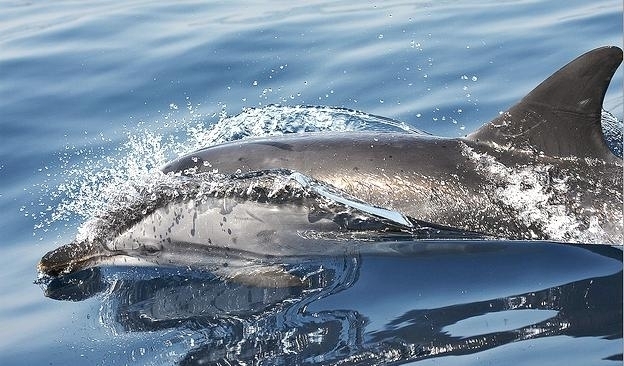 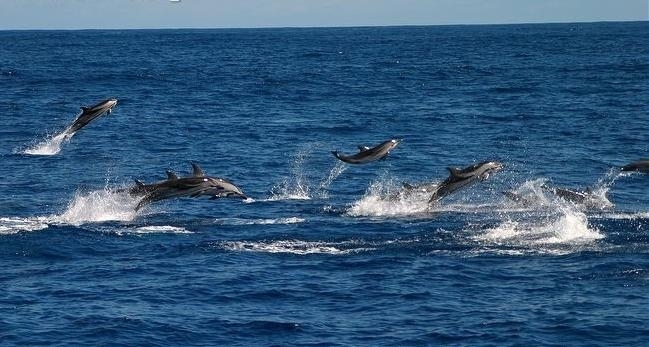 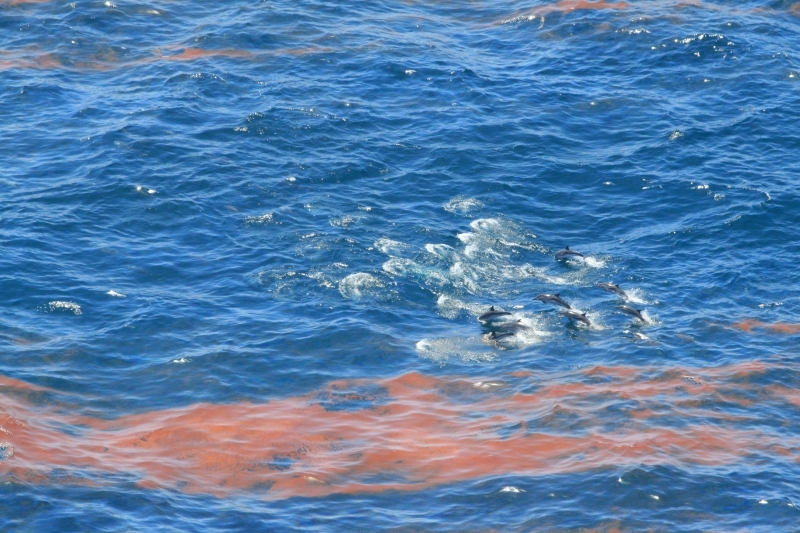 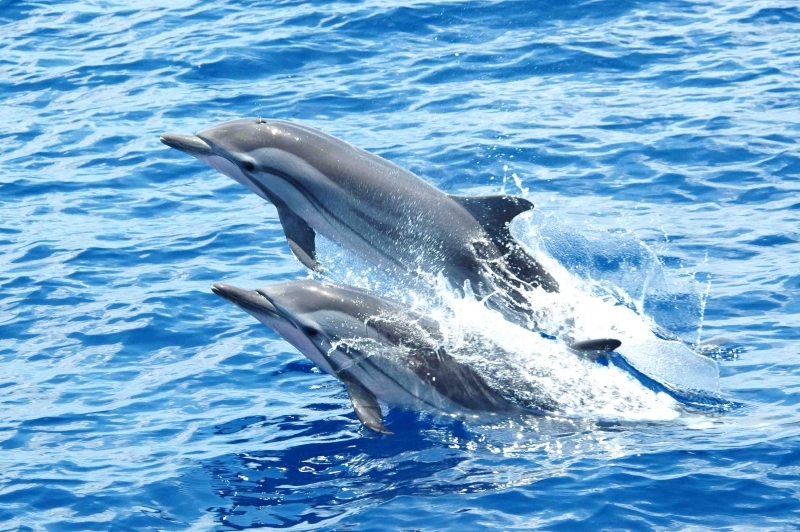 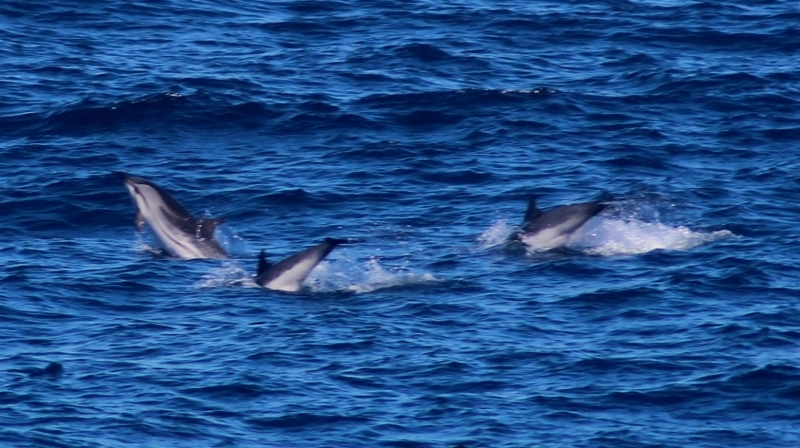 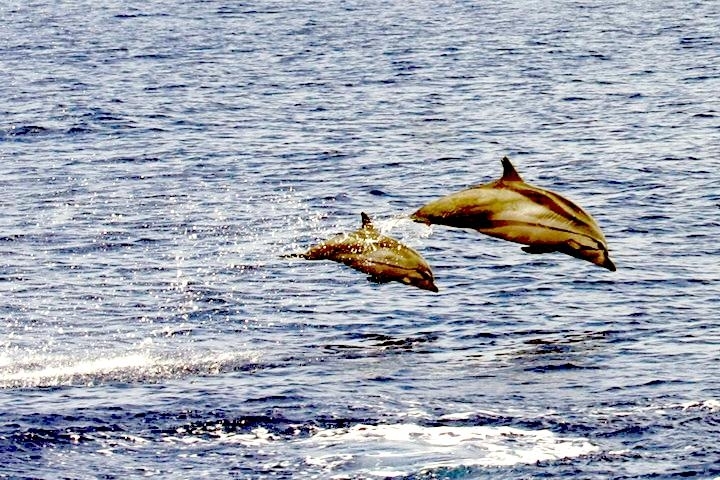 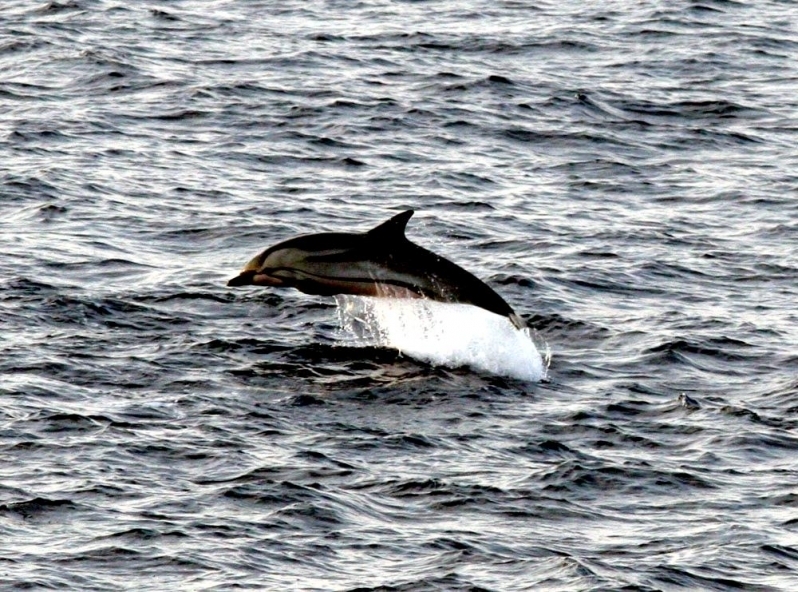 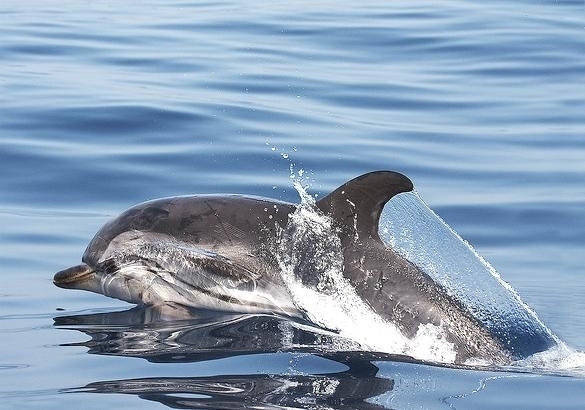 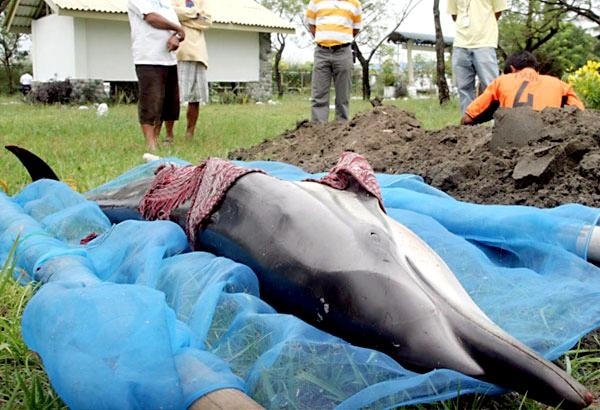 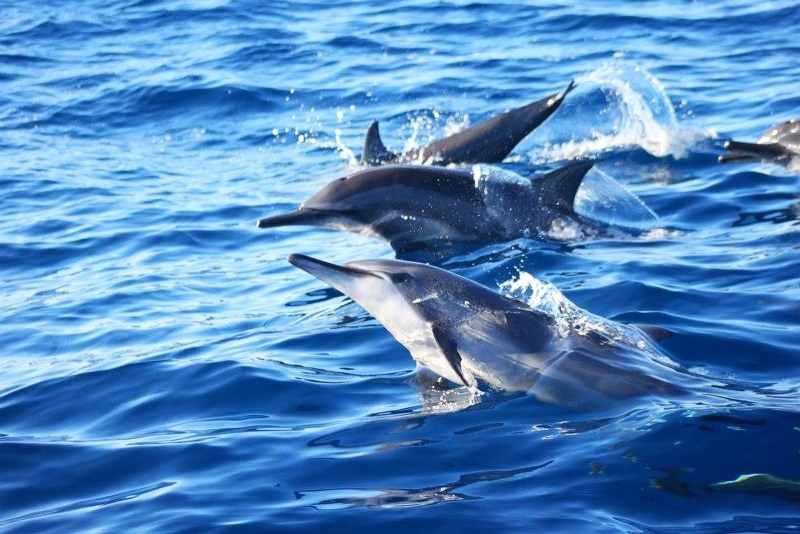 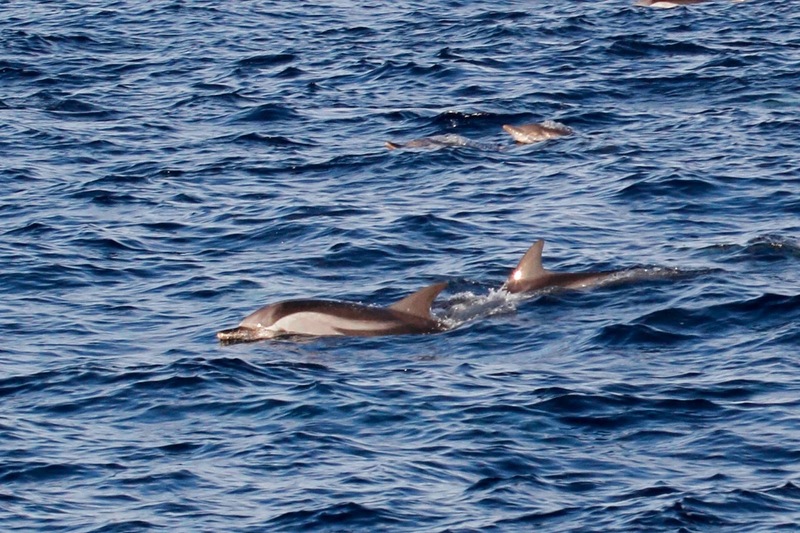 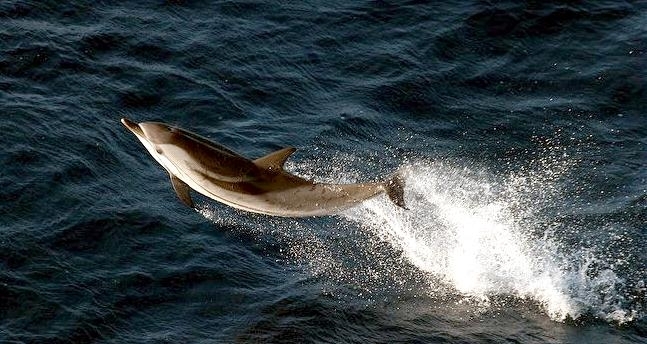 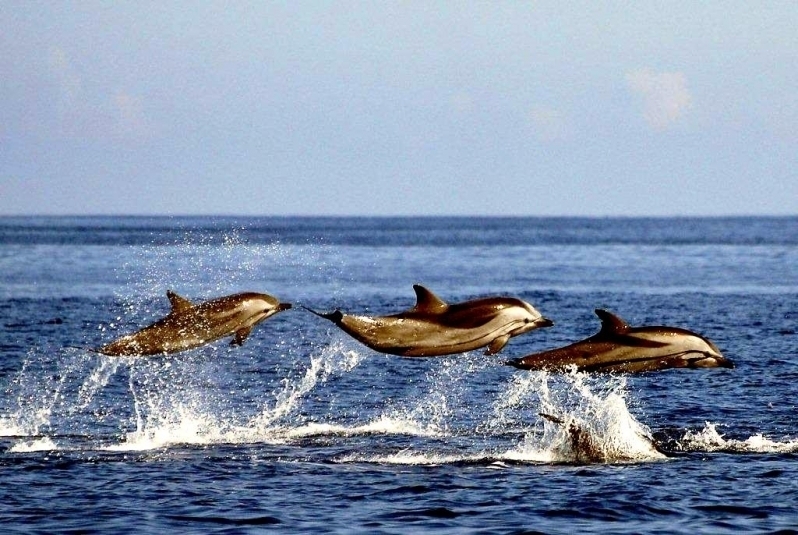 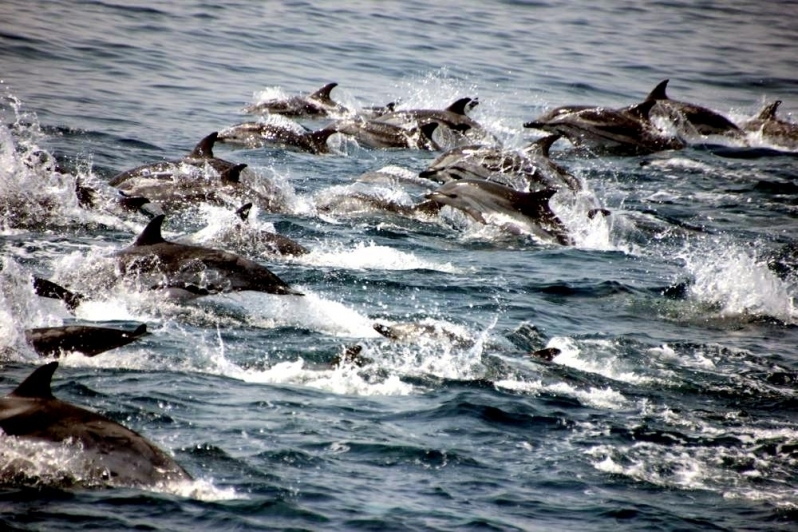 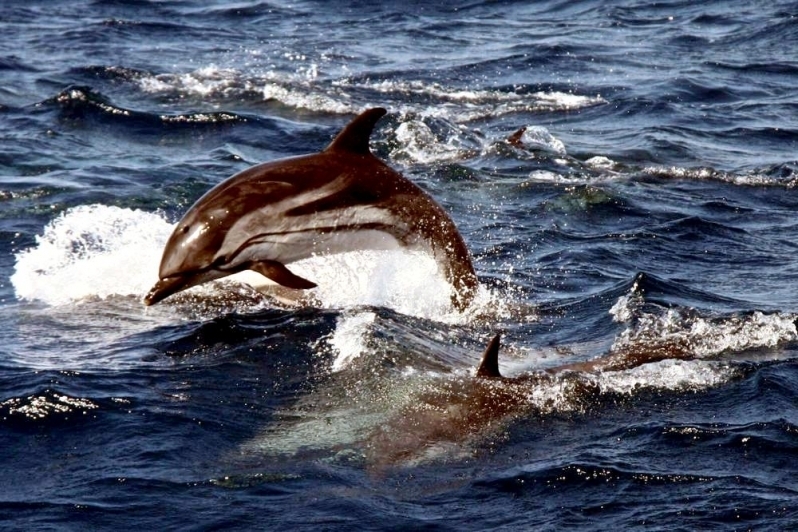 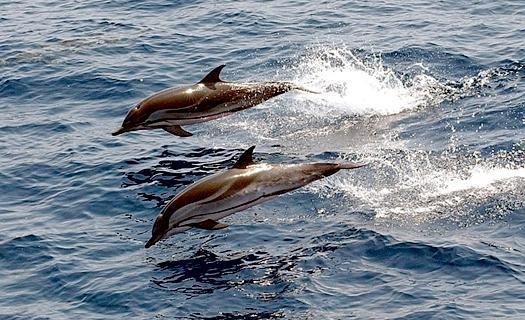 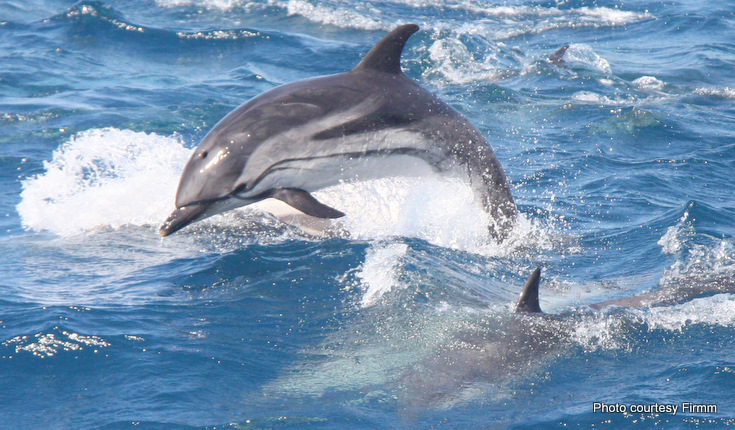 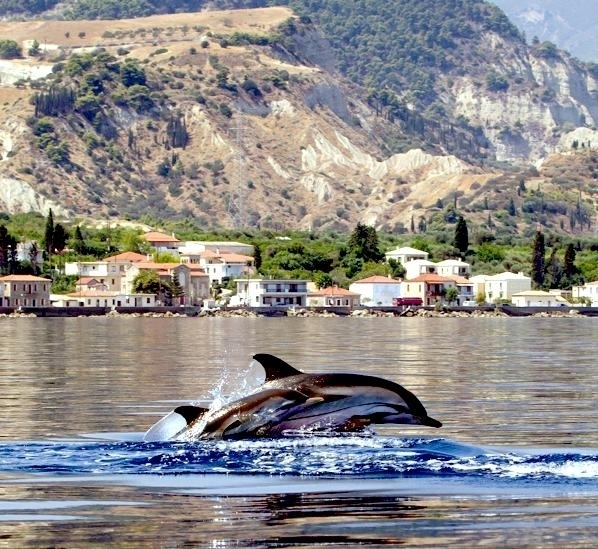 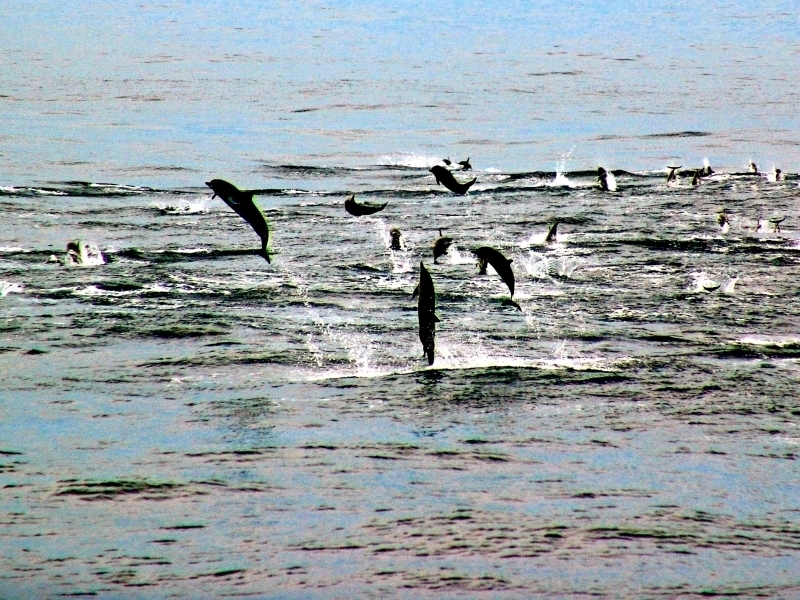 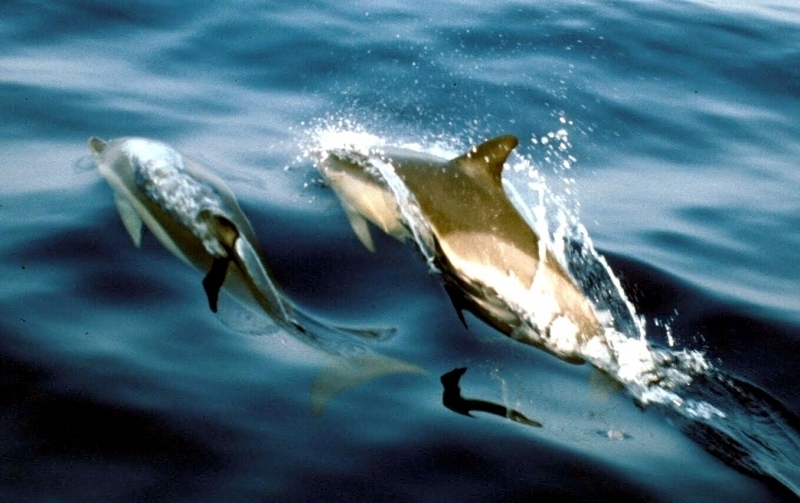 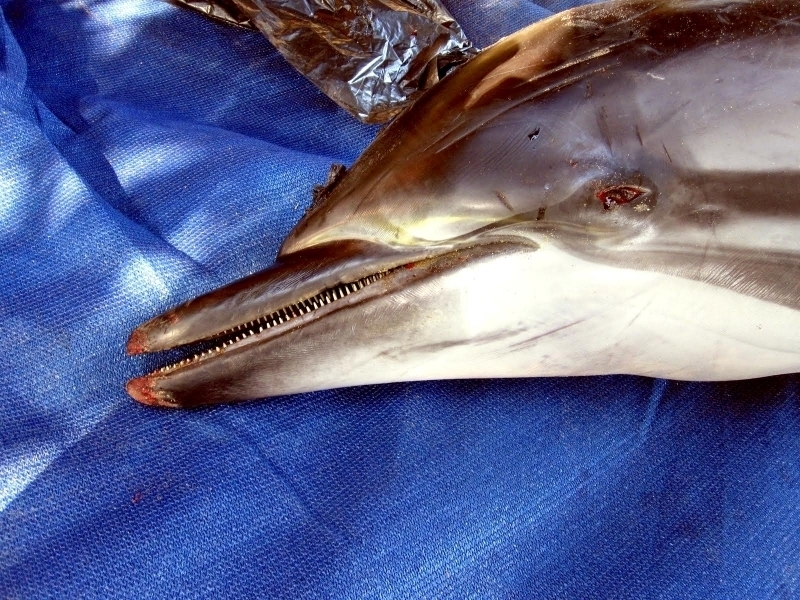 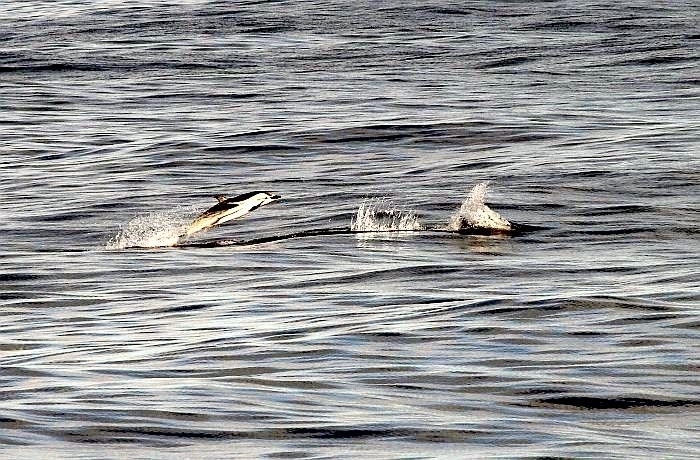 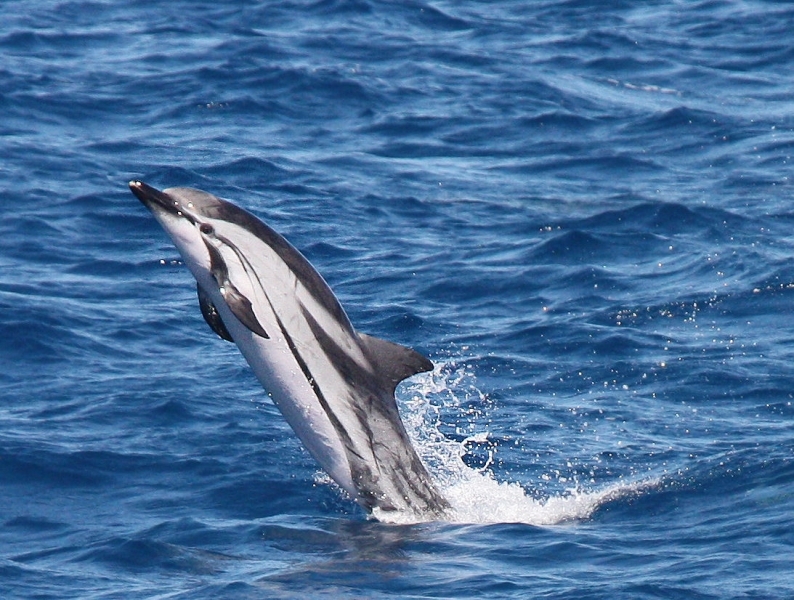 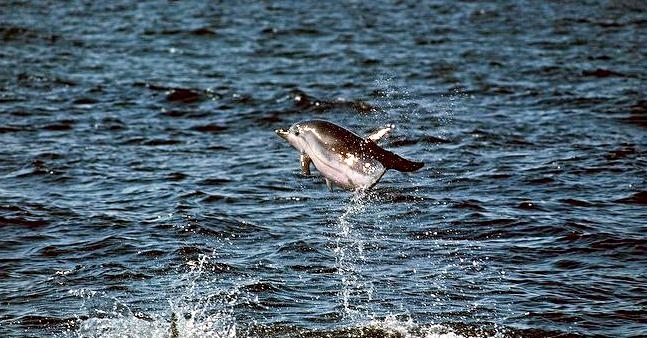 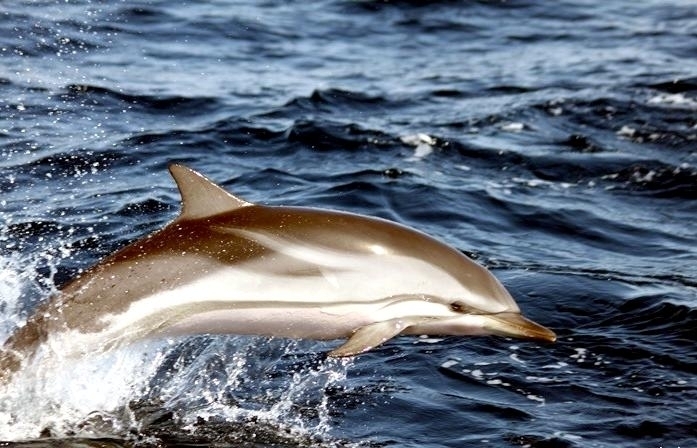 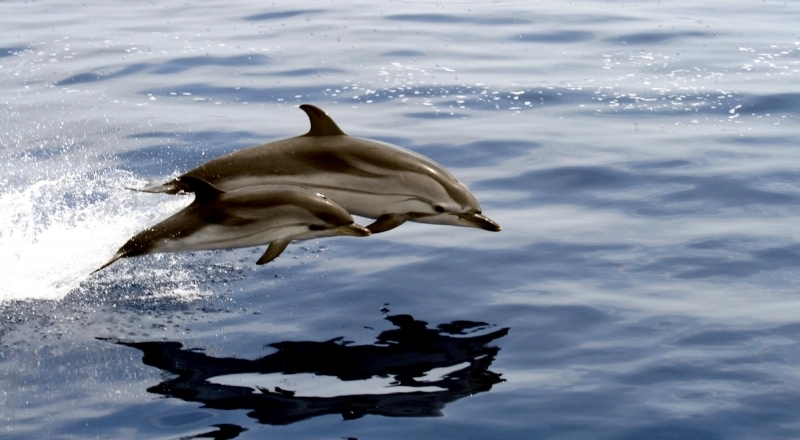 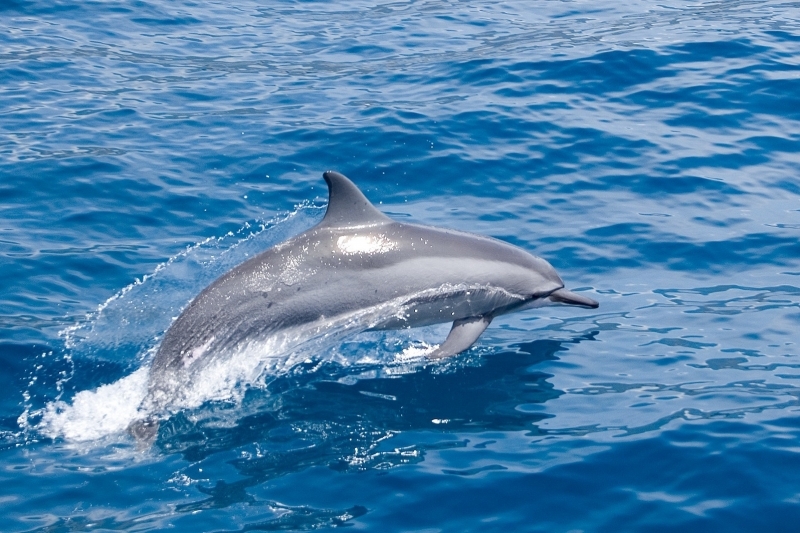 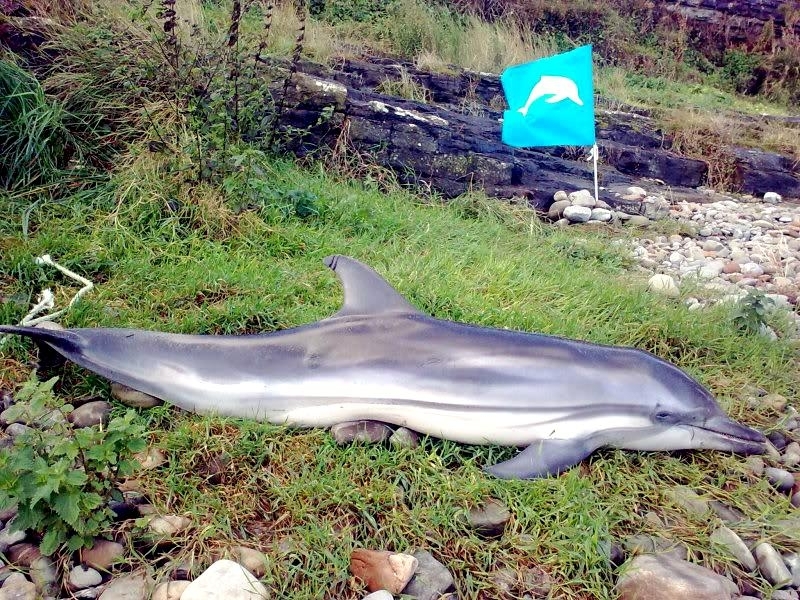 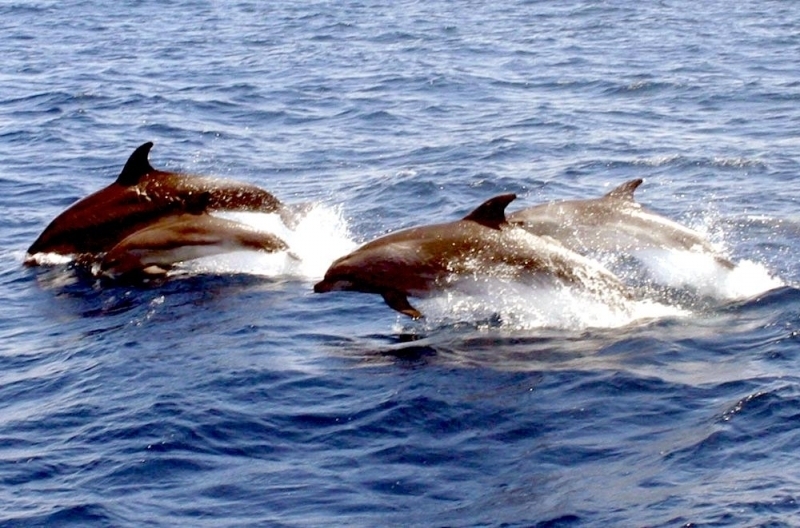 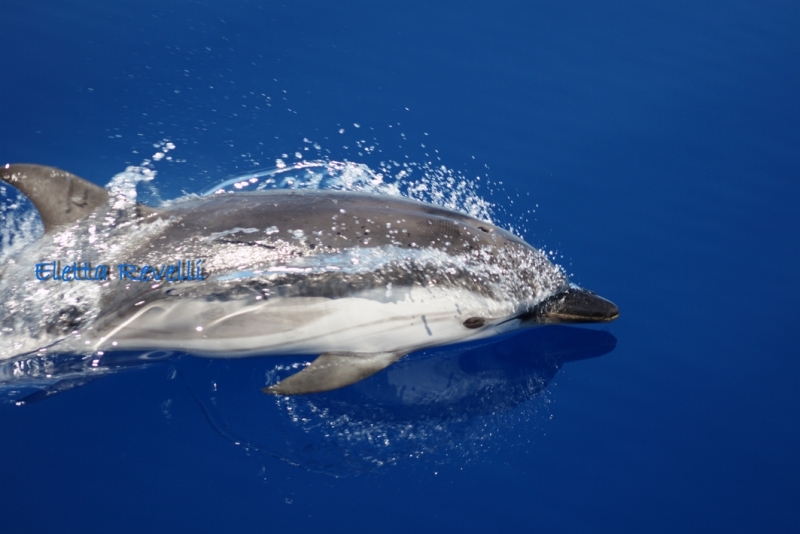 Striped Dolphins occupy both offshore & inshore waters above 20°C. 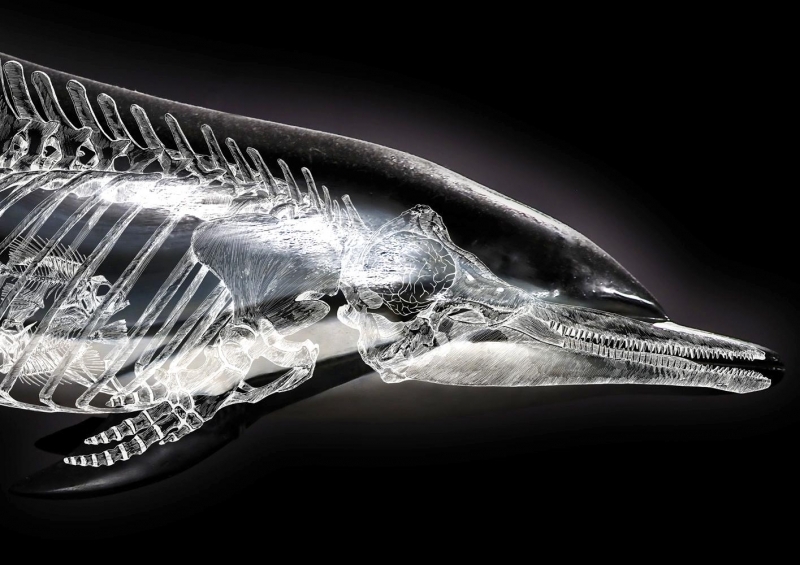 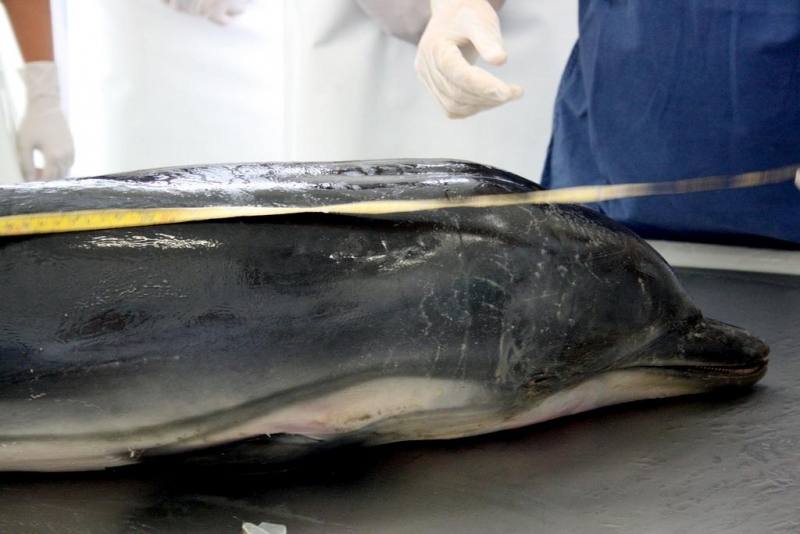 Their diet varies by region feeding on cephalopods, crustaceans & bony fishes. 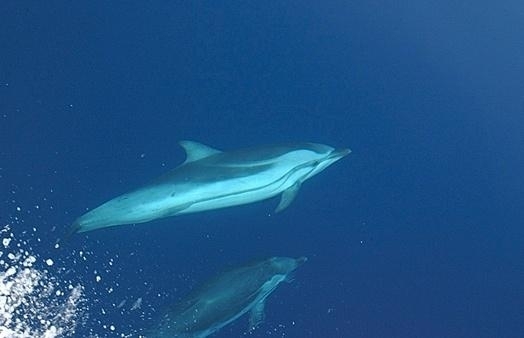 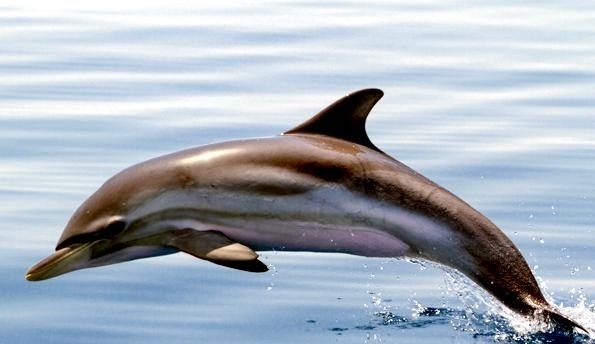 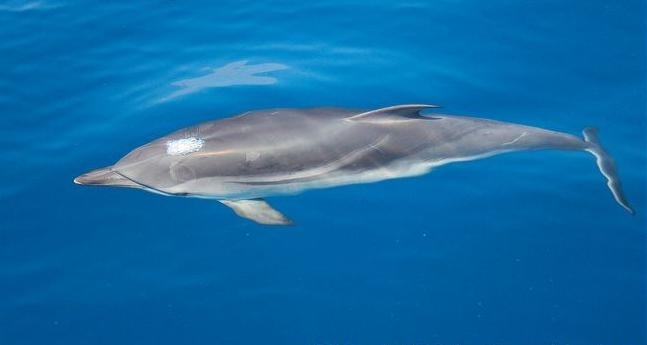 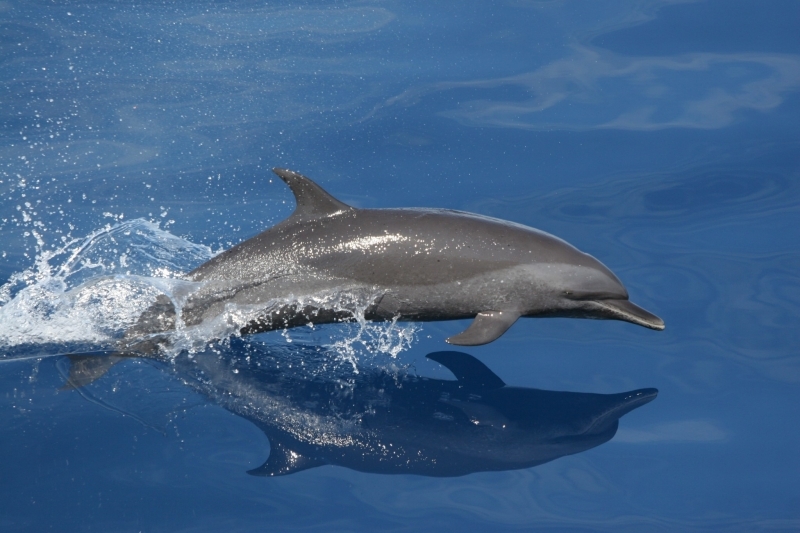 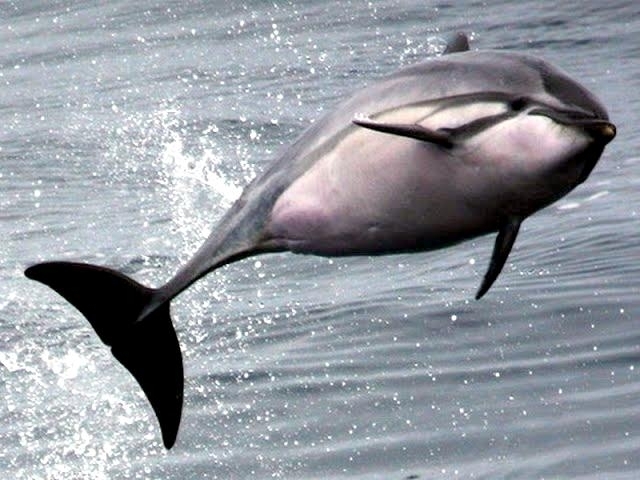 Striped Dolphins feed in pelagic or benthopelogic zones, often along the continental slope. Males reach sexual maturity between ages 7 to 15, females between 5 to 13 years. 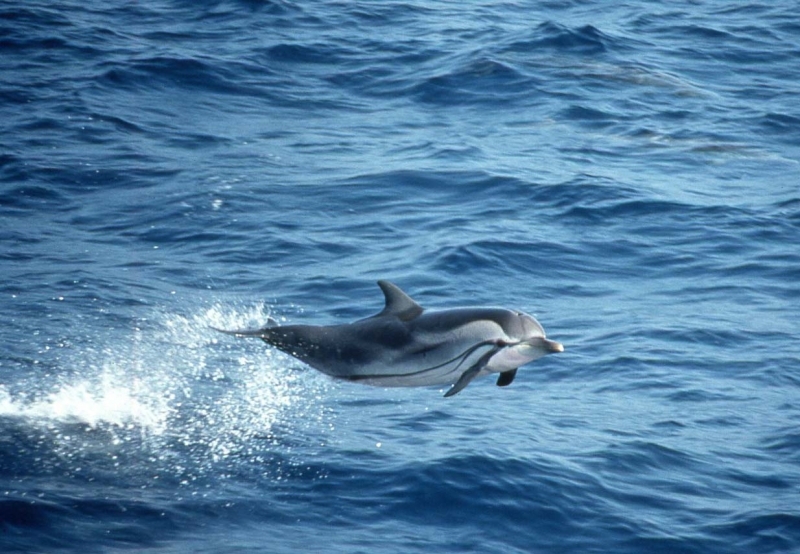 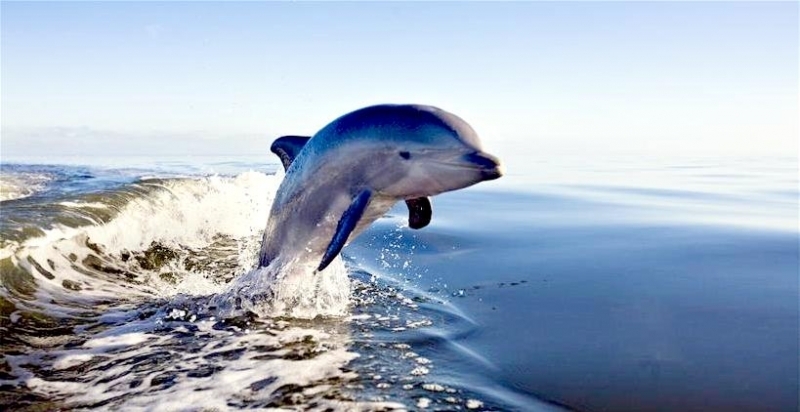 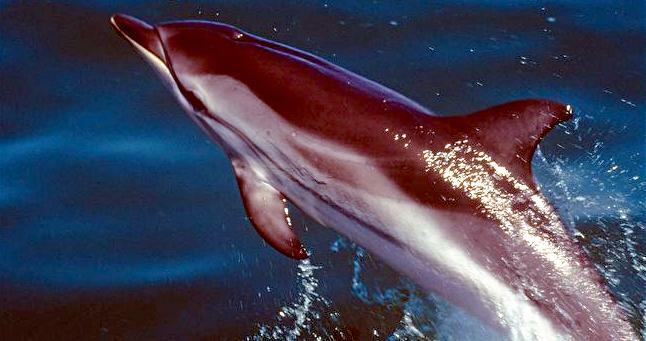 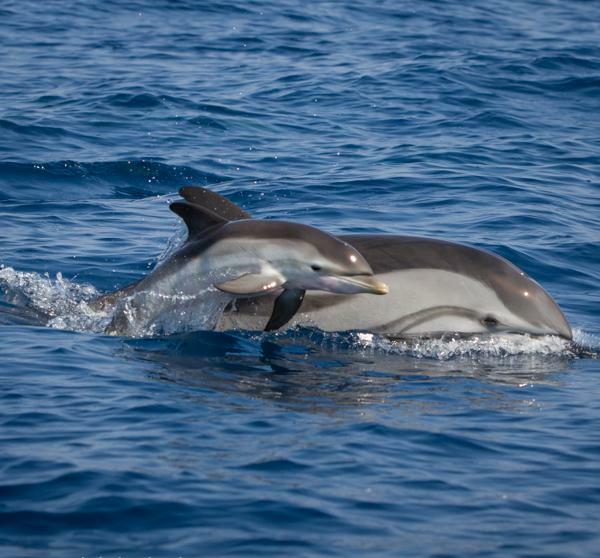 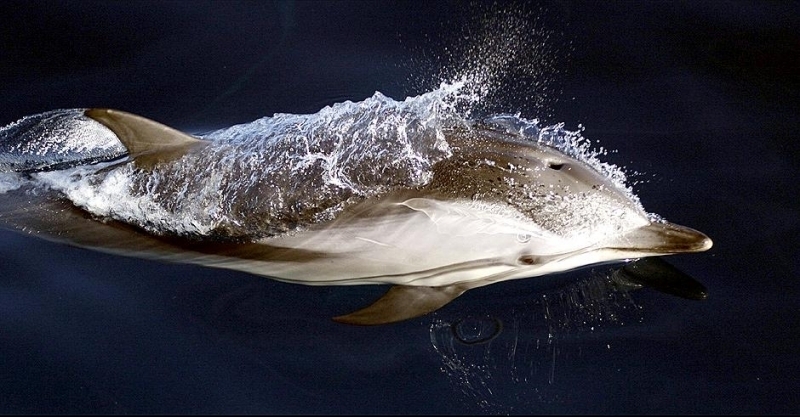 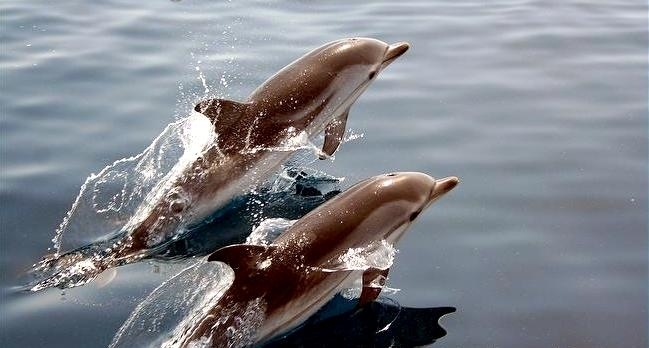 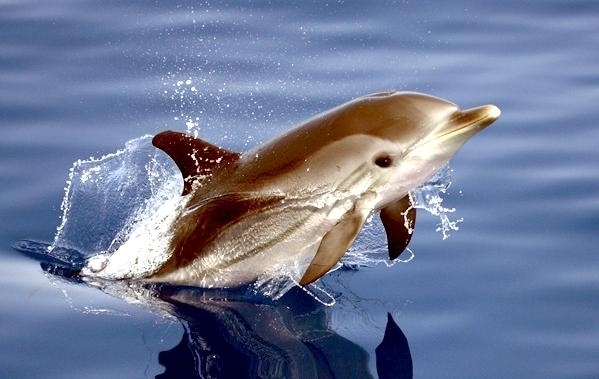 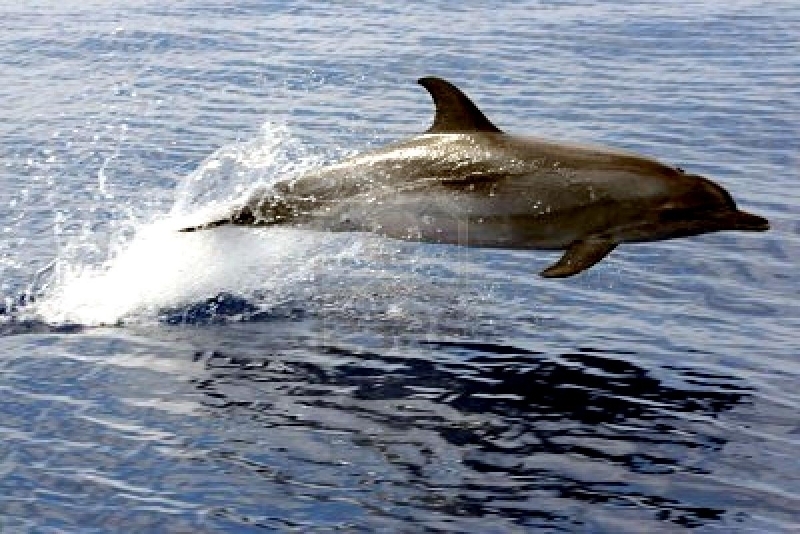 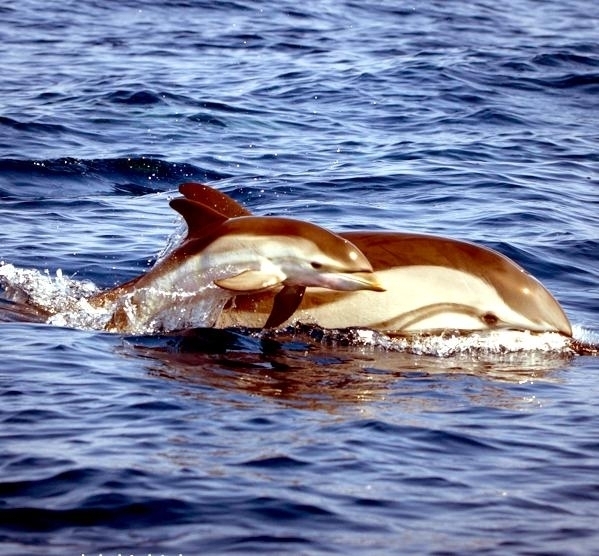 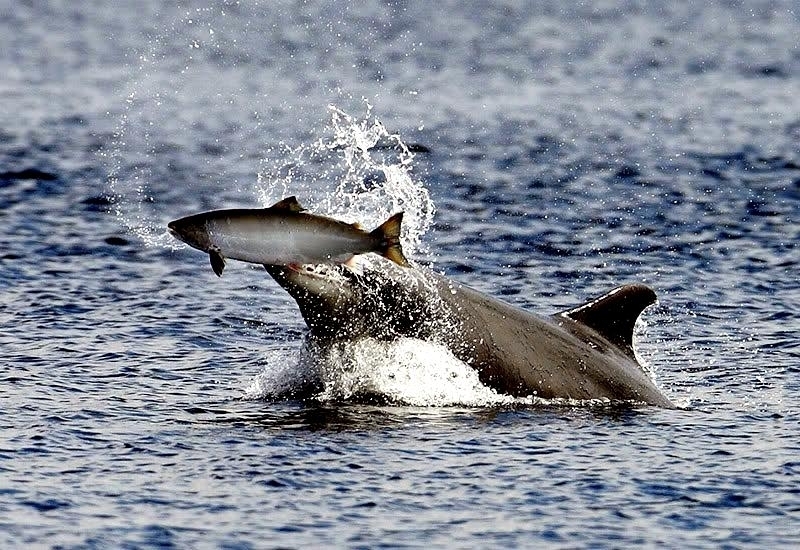 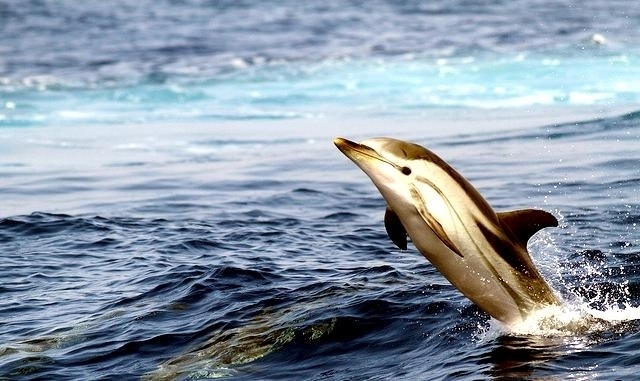 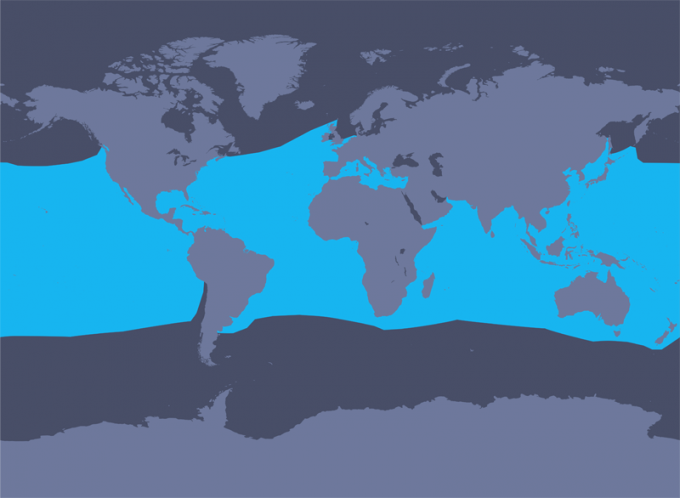 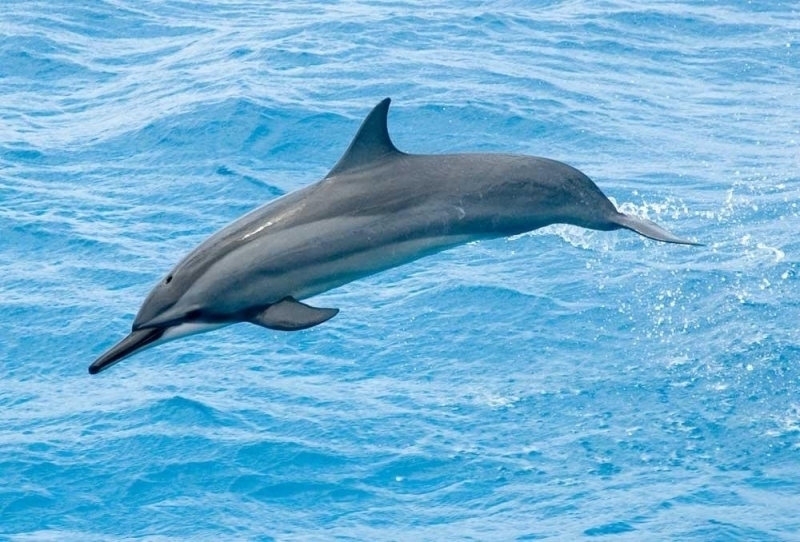 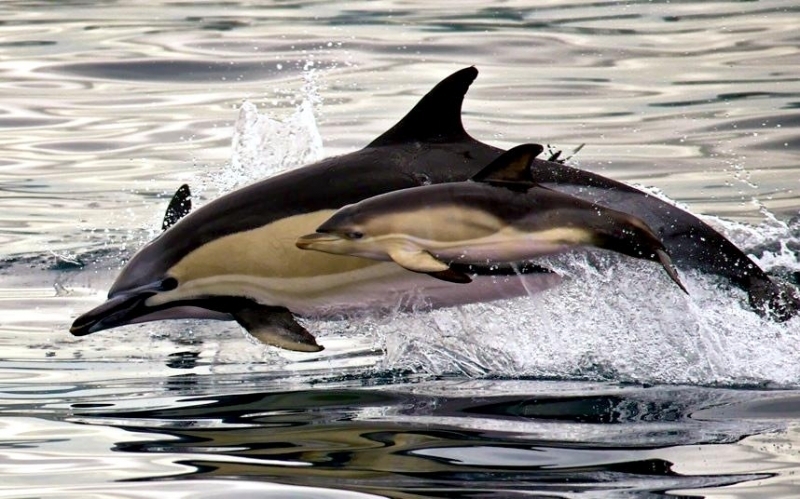 In the western North Pacific range of the Striped Dolphin, mating season takes place in winter and in early summer. 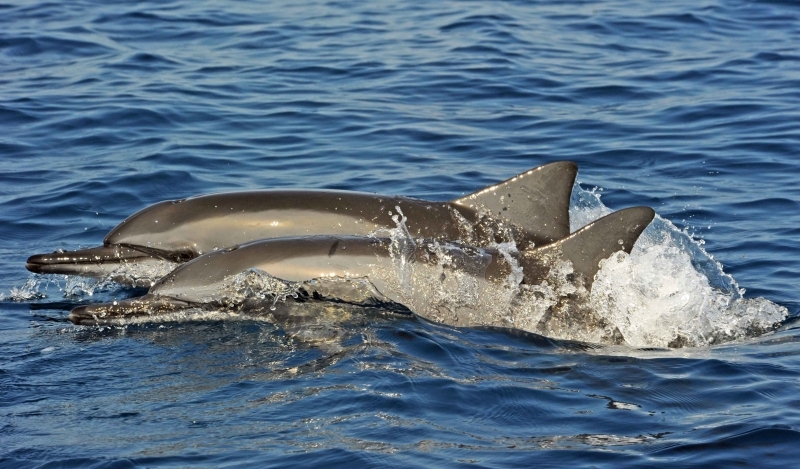 In the Mediterranean, mating season takes place in the fall. 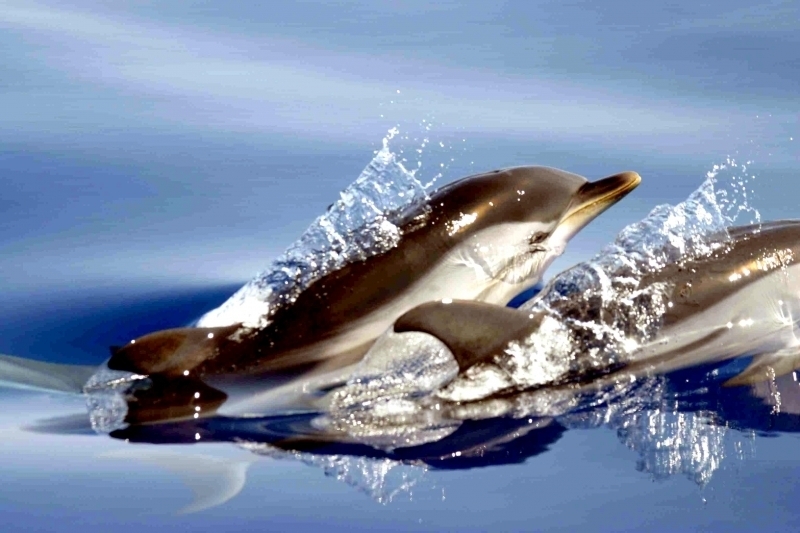 The gestation period lasts between 12 to 13 months during which time fetuses grow at an approximate rate of 2 to 75 centimeters per day. 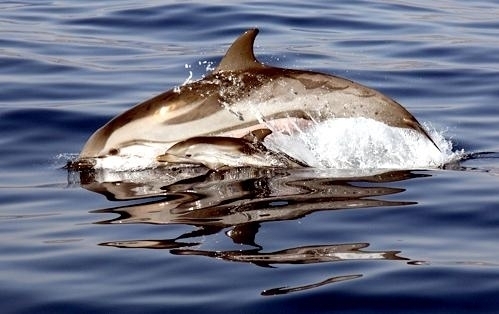 Newborns measure 0.9 to 1 meters in length and weigh about 11.3 kilograms. 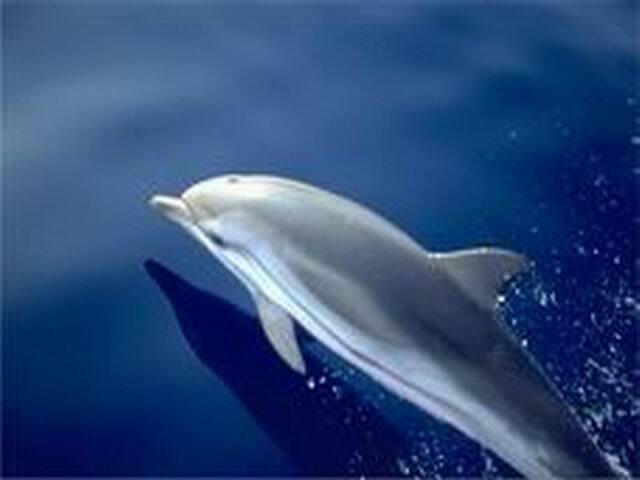 The nursing period lasts for about 16 months. 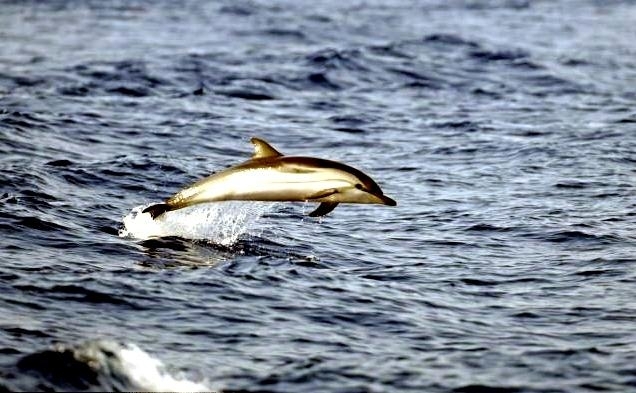 Female Striped Dolphins typically have a 4-year calving interval, resting for 2 to 6 months between lactation and the next mating season.